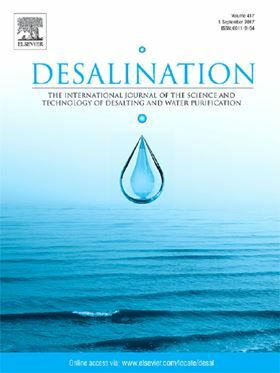 The research article 'Salt separation from water using graphene oxide nanochannels: A molecular dynamics simulation study' has been published in Elsevier journal Desalination (Volume 460, 15 June 2019, Pages 1-14). Recently, water transport through graphene oxide (GO) nanochannels has gained much attention because of its potential applications in desalination and water filtration. In this work, molecular dynamics (MD) simulations were carried out to elucidate the filtration efficiency and water structure in GO nanochannels of varying oxidation degree (from 0% to 40%) and interlayer spacing (from 0.6 nm to 1.0 nm). The results from these simulations show that ion permeation is observed in 1.0 nm channels, but ion rejection is close to complete for the narrower channels, irrespective of the degree of oxidation. Furthermore, water permeation increases with increasing interlayer separation and decreases with increasing oxidation degree. In general, water molecules prefer flowing through unoxidized regions of the narrower channels, but show no preferential path when flowing through the wider ones. Moreover, the analysis of the interaction between water molecules and the hydroxyl groups inside the GO channel shows that OH groups play a vital role disrupting the solvation sphere of the salt ions. However, with increasing oxidation of the GO wall, the formation of intra-layer hydrogen bonds becomes relevant, decreasing the overall number of hydrogen bonds involving water molecules, and thus preventing further decrease of the water permeance. To sum up, our results indicate that the best GO channel for the desalination is the one with interlayer spacing 0.8 nm and oxidation degree of 10% or lower. Dense vertically aligned carbon nanotube (CNT) arrays can be applied as multilayer transverse flow CNT membranes (CFTM) for efficient desalination. Biomimetic approaches have the potential to overcome the problems associated with existing membranes, including excessive energy consumption. Applications of AI tools in desalination and water treatment are reviewed.